copyright 2010 grades 4-6 fantasyThis was a different book, and while I enjoyed it, it was not one of my favorites. Maude is a mermaid with two tails and Tony is a boy with webbed hands. Both are made fun of. Maude is captured for the circus and Tony saves her. 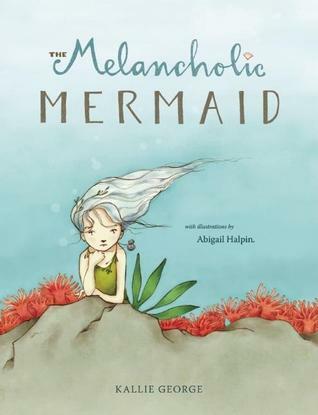 It was written when author's father asked her what mermaid tears look like.You'll have to read the book to see. This is a lovely children's book - long enough to be a substantive story - and short enough to get through in one sitting. They are delightful characters, the writing is terrific (and we have the good fortune to meet the author!). Ryan (6) loves this book! OMG I love emo hipster Maude and Tony. SO MUCH. This book doesn't take itself too seriously, which makes its message of tolerance, acceptance, and young-person angst work. At least, I don't THINK the book is meant to take itself too seriously... Loved the art. This was a very strange book, and it seemed incomplete. A double-tailed mermaid is bullied and then ends up captured by the circus. A boy with webbed hands tries to save her. I did really enjoy the pictures, though. The cover of this book really grabbed me while I was shelving at the library, so I actually checked it out and took it home just to drool over the illustrations. So gorgeous! I would totally buy this just for the whimsical pictures. like a modern fairytaleloved both text and pictures!Good read! Another lovely book from Kallie George. The art is beautiful. Perfect for young kids caught between wanting to be special and wanting to fit in. And for little kids who want to be mermaids. Lovely. Some gorgeous illustrations in this and a good story. I usually don't bother to add books I read to my 4 year old daughter here, but this one was excellent. Good story, beautiful illustrations. We adore it. This is just beautiful! I love this story. Plus to add to the magic, the illustrations are just amazing!Love it! I am buying my own copy. A wonderful story with beautiful illustrations. A sweet story of friendship between two unlikely characters: a mermaid with two tails and a boy with webbed fingers and feet. I loved the illustrations. Kallie George Abigail Halpin - I’m an author, editor, and speaker living in Vancouver, BC, near the sea. When I’m not writing or editing, I’m teaching creative writing workshops.I have my Masters of Children's Literature from the University of British Columbia.I love picture books, fairy tales, beautiful art and music, and baking cookies.